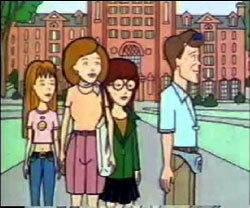 “College Bored” was the third episode of the first season of Daria. This episode features Daria dealing with her parents' worry she won't get into a good college, their curious nostalgia for the college they attended, and Quinn's early attempt to join the "Greek Life." Meanwhile, Jane deals with a family reunion. The Morgendorffers visit some friends who are preparing their daughter Ramona for the SAT tests (despite their daughter being a toddler) to ensure she'll attend the right college. After the visit Helen and Jake decide to enroll Daria and Quinn in a college prep course, to the annoyance of both girls. The prep course is held at Lawndale High and includes several freshman and sophomore students. The instructor coaches them on how to take exams and invites them to consider what they want out of college. Students daydream about their college future life: Kevin imagines himself as a successful QB; Brittany imagines receiving her diploma while walking on a model runway; Jane imagines herself a successful artist, having ditched college; Quinn imagines herself being the roommate/object of desire for three good-looking male students; Daria imagines being invited to go to grad school while still a freshman (however, even in her fantasy, the rationale for the invitation disappoints her). All students have to visit a college as part of the course, so Jake and Helen enthusiastically decide to take their daughters to their alma mater, Middleton College. When they visit the campus a few days later, they are greeted by Heather, their tour guide. The four quickly separate as Helen and Jake want to check his old room and Quinn wants to check the fraternities and sororities. Helen and Jake reminisce in his old room, whose student occupants seem only to hang out, listen to loud music, surf the web and pay no attention whatsoever to the visitors. Suddenly remembering the sexual mores of college students, Helen rushes out in a panic, searching for Quinn, asking students of her daughter's whereabouts and posting notices. Helen's searches are fruitless and she succeeds only in being harassed by male students who are pledging fraternities. Meanwhile, Jake visits the loan office and is confused by all the fees, but the Assistant Bursar is ready to direct him to a "family" business with a wide variety of interests that offer really good loans to people like him. "You play the ponies, Jake?" Daria and Heather end up in Heather's room, where Daria can see college student life firsthand: watching Sick, Sad World and, according to Heather, working a stupid job and asking the parents for money. When Heather receives her term paper by mail, full of mistakes, Daria turns it into an opportunity to make fast money, as she offers to rewrite or correct papers for the ignorant and/or lazy college students. Quinn, out on her own from the rest of her family, is mistaken for a sorority pledge and later ends up at a party. She teaches some frat boys a drinking game and ends up later being hailed as "Keg Queen". It is while she is being hailed as such that the rest of her family, along with the police, finally find her. The relief of finding her is brief, as they are all thrown off campus by the police for allowing a minor into a frat party. Later, back at the prep course in Lawndale, the students relate their experiences: Kevin tells of a hazing he was subjected to (to his delight); Brittany relates a poetry reading she attended and participated in; Mack mentions the "first-string exemption," which allows top athletes to never have to take exams (to his disgust); Daria and Quinn argue about how they had been thrown out of Middleton, to the chagrin of the instructor. Back at home the Morgendorffers celebrate the invitation Quinn has received for Manatee College in Florida... until Daria points out the college provides no classes, only accommodation for an extremely high price. The conversation is interrupted by a college Middleton student who has come to provide payment for some of Daria's papers: this quickly leads Helen in confiscating the money and ending her money-making activity, as Daria laments later over pizza with Jane. There's a coloring mistake in the classroom scene which depicts Jodie with white arms and legs, and in another Scarlett's jacket becomes beige. The famous Middleton College would be revealed in subsequent episodes to be famous for being a third-tier school at best, and Helen is lying about it being good to keep Jake happy. The letter Quinn receives from Manatee College is reproduced in The Daria Diaries. Kevin's fantasy involves him cheating on Brittany and her fantasy involves Kevin declaring he loves her and then being dragged away while she ignores him. The music during Brittany's fantasy scene is one of the few instances where the original tune wasn't replaced by generic music on both the Video and DVD releases, that was because of the announcer singing along to its distinct melody. The song in question was "The Female of the Species" by the British band Space. Kevin refers to "my big brothers" at college; this could be a metaphor for the members of the fraternity Kevin visited. "The Daria Database" and "Mart of Darkness" would present him as being his parents' first child. Jane's views on college would resurface again in Season 5 and "Is It College Yet? ", where she'd again not want to go to college, afraid she wouldn't be able to manage it and wouldn't be good enough to get in. Daria only loses her essay-writing job because Helen found out: when Jake learns about it, his only concern is whether Daria remembered to get paid in cash ("good girl"). Alternate universe versions of this story include Homeless Daria 3: A College Try Gives Me Blisters by RX-87 and Mad Dog's Legacy 3: The Old Middleton Try by Hyrin. Daria writing papers for the undergrads in this episode has been used in some fanfiction as a possible side occupation for Daria, exploring her mercenary side. Examples include: Daria's Season of Good Will and Out of the Slushpile, both by Nemo Blank. Middleton College would later be used or referenced in some fanfiction works. Jane's fantasy of having an loft where she can work on her artworks was explored further by Wouter Jaegers in his Dariarotica story Brushed off in which Jane made it a reality, using her loft not only as a workshop but also as a living space. This page was last edited on 26 April 2018, at 01:46.